John Wall scored 23 points to go along with 15 assists but it wouldn’t be enough as the Wizards drop Game 1 of the postseason to the Toronto Raptors, 114-106. Markieff Morris scored 22 to go along with 11 rebounds and six assists and Mike Scott added 14 off the bench but the Toronto Raptors win Game 1 of a series for the first time in 10 tries. Toronto ran out to an early 22-13 run but the Wizards were able to withstand the first punch of the game from the Raptors. Washington found their groove in the second quarter behind the ultra-aggressive play from John Wall who scored 13 points and dished out 10 assists before halftime. With both Marcin Gortat and Ian Mahinmi in foul trouble, Mike Scott saw some extended time and took advantage. Washington used an 11-0 run late in the second quarter to take the lead into halftime, 59-55. The game seesawed back-and-forth for the third quarter and the Raptors held the slimmest of leads, 86-85 entering the fourth quarter. The tide turned for Washington two minutes into the fourth quarter when Mike Scott committed a flagrant foul on Kyle Lowry. Lowry knocked down both free-throws and Toronto also scored on the possesion regaining the lead, 92-91. The Raptors then used an 11-0 run since that flagrant foul to pull away in this one. Washington played Toronto tough for 3.5 quarters but it’s clear, that won’t be enough to beat this team. Toronto’s bench was one of their biggest strengths coming into the series. The question for Washington was, would their bench be able to keep pace with them? Outside of Mike Scott who scored 14 points, that would be a resounding no as the rest of the Washington reserves combined for just seven. Delon Wright, playing more minutes than usual due to Fred Vanvleet’s injury scored 17 points for a bench unit that combined for 42 points tonight. In the first half, it was OG Anunoby stepping up for the Raptors as he knocked down two three-pointers early on. Washington lost CJ Miles in transition one too many times and he made them pay, knocking down 4-7 three-point attempts for 12 points off the Raptors’ bench. Toronto went 11-deep tonight so Kyle Lowry and DeMar DeRozan were able to stay fresh as they logged 37 and 35 minutes respectively. On the flip side, the Wall and Beal logged 39 and 41 minutes respectively and didn’t look as spry down the stretch. Having the confidence to play up to 11 players in the playoffs is a wonderful advantage that most teams don’t have. Toronto was able to play guys like Delon Wright, Pascal Siakam and Lucas Nogueira (played all nine of his minutes in the fourth quarter) down the stretch in the fourth quarter and help build out the Toronto lead against the Washington starters. It’s pretty clear that the Wizards will need better games from Kelly Oubre and Tomas Satoransky if this series is going to be competitive. 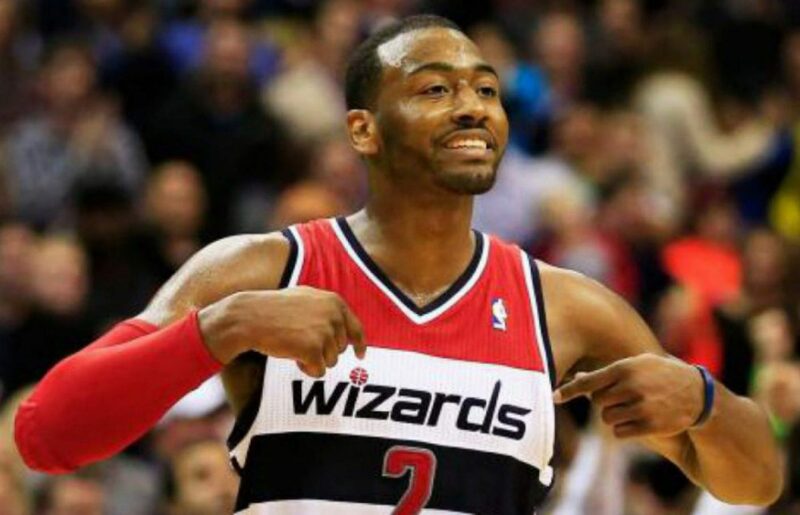 Many wondered if Wall would be able to play heavy minutes while also be effective after only playing four games in his final tune-up prior to the postseason. It’s very clear, Wall is A-OK.
Wall was super aggressive tonight looking to push the ball in transition and didn’t really settle for any long twos tonight. Toronto dared Wall to take three-pointers early on and he won that battle knocking down 2-3 from range in the first quarter. With the pace of the game slowing down and favoring the Raptors, Wall looked to push the ball and get out in transition. Those resulted in some baskets from close in and wide open shots in transition for the Wizards. It also opened up the floor for the Wall and Gortat pick-and-roll to flourish as he was able to spoon feed the big man for shots around the rim. Wall wasn’t super effective tonight as he shot just 6-21 from the field but he wasn’t settling. He was super aggressive in attacking the hole but unfortunately for the point guard, he couldn’t convert from close in nor was he getting calls. It didn’t end in victory, but John Wall was the main reason the Wizards were able to stay competitive in this one. Up Next: Game 2 of the series is Tuesday night in Toronto.